If I had to pick a day that holds the most meaning for me in my life, it would be May 17th, the day of my ordination to the priesthood. For the vast majority of my priesthood thus far, I was "the young priest." But, eighteen years after ordination, although still well below the median age of priests, I no longer get the response so common in my earlier years, "You look too young to be a priest." In fact, now I'm surrounded by college students who tell me that I'm just like their father. I live in a rectory in a nearby parish to my university. This evening, the pastor and I had supper together and the entire time I was sitting there, I was thinking how privileged I am to know a priest like this. He's been a priest for 49 years, most of them spent as a missionary in Peru. He's almost twice my age (which makes me feel pretty good considering everyone I serve is half my age) and as we conversed, I felt this overwhelming sense of gratitude for the gift of his example and friendship. 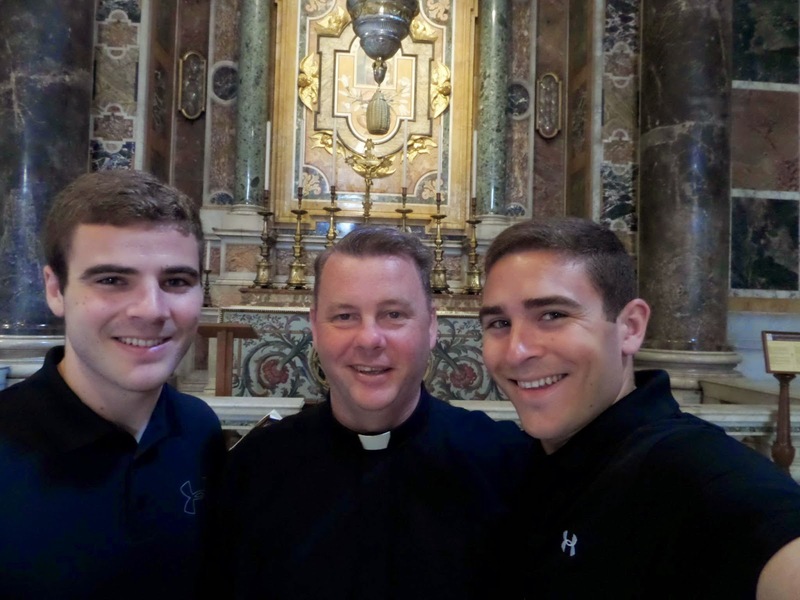 By God's grace, I've had the opportunity to work with a lot of young priests and seminarians. I've also lived and worked with priests who were substantially older than me. This past year at the BU Catholic Center, I worked with two young Jesuit scholastics. When I was a parish priest, I often had seminarians stay with me, serve with me, and come from my parish. I've had young priests work with me and I've had senior priests work with me. This opportunity to live and to work with great priests and seminarians has been a true grace in my life. One of the things that has surprised me as a priest is that even after eighteen years of priestly life, I still feel as though I am new. I am surprised every day by the gift of my vocation. The seminary sends a seminarian to me and I am struck by what I learn from him. I live with a priest ordained almost 50 years ago and his mentorship is something entirely fresh and rejuvenating. But, it is not only the clergy with whom I am assigned. It is the people with whom I serve. I live in a rectory where the example of the pastor is a constant source of education for me. But, I go to work with young men and women who are half my age (okay, a little more than half my age) and they educate me too. (By the way, those of them who read this blog will be sure to remind me that I just wrote those words). But, it is true. One of the great graces of priesthood is being surrounded by people--young and old--who educate me. These people move me. They confirm within me what I already believe and they encourage me to be a better Christian and a better priest. This year, on the eve of my priestly anniversary, I am particularly grateful for one thing. During these last eighteen years, despite my abundant sins, faults, and weaknesses, God has surrounded me with men and women--priests, religious, and laity, young and old--who have caused my heart to leap with joy. These people awaken within me a continued awe at the beauty of the Church. In fact, last night--out of the blue, a man texted me whom I had not heard from in several months. In the text he told me that he goes to Mass every Sunday now. After all that he's been through in his life, the fact that he goes to Mass really caused my heart to rejoice. And, as I write these words, a student just texted me to ask, "Do you want to hang out on Monday?" Priesthood continues to surprise me. I am surprised to hear how a particular seminarian discovered his calling. I am surprised to see a conversion. I am surprised to witness the generosity of the young men and women with whom I serve. I am surprised by their missionary zeal and I am surprised by the way that they themselves are surprised by God's movement in their lives. I am surprised by the faith of our students and by the depth of their humanity. I am surprised by all that God has done during these eighteen years. In my life as a priest, I have been loved and cared for by so many good people. I have lived so much of my priesthood at dinner tables with parishioners or at lunch tables with students. It's all been quite surprising. I think one of the great gifts of priesthood for me has been that the people whom I have encountered--be they priests or lay people--have educated me in living a more human life. Even now, I'm twice the age of the people whom I serve. But, they educate me. I hope that I educate them too. But, I wake up every day and am filled with surprise by our communion. Eighteen years ago I became a priest. Eighteen years later, I can testify that I am more surprised today about the priesthood than I was in my first few months. I am surprised by the love and friendship that has been such an integral part of priesthood. As a priest, I hope that I am able to move others. If I can, it is only because I myself am moved by Another. I discover within the friendship of the Church a life that makes me more human. Whether it be a 73 year old priest or a 20 year old student, a couple married for 50 years or a first year seminarian, a lifelong Catholic or a recent convert, a young person who dedicates himself to serving the Church or an older woman who cares for her ill husband; all of these people move me. They educate me. They encourage me and spur me on towards holiness. After eighteen years of priesthood, what most surprises me is that every day, I am joyfully surprised by the people who surround me. I am surprised by the love that marks our life. Christ has blessed me by surrounding me with people who have cared for my vocation and nurtured it. I'm surprised by the love I've experienced since the day of my ordination. I hope that all of those who have shown me this love know that I love them too. Yeah, I love them.